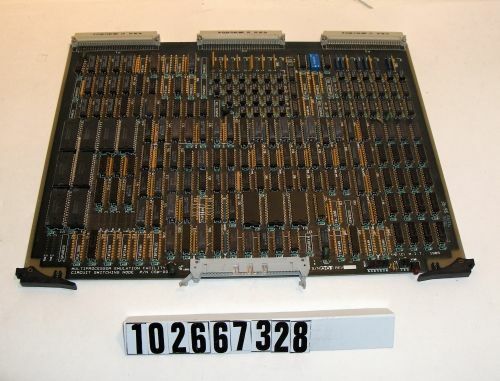 MIT/Motorola's Monsoon (dataflow) circuit board. Multiprocessor emulation facility circuit switching node printed in white ink next to the part number.. GMP 1985 printed in white next to the part number. Copyright MIT 1985 printed on the board. Component side of hte board has various integrated circuits, resistors, and test connectors. On the extractor edge of the board is a ribbon connector with two bent pins. Opposite edge has three by 32 male connectors. There are a number of jumper corrections on the component side of the board. 19 chips are missing.